On-grid micro inverters | Atmosfera™. Альтернативные источники энергии. Солнце. Ветер. Вода. Земля. 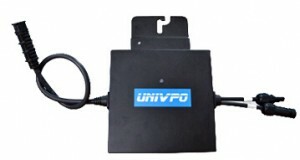 On-grid micro inverters UNIVPO M248 allow connecting the single PV modules with capacity from 160 to 300 W directly into power grid for public use. 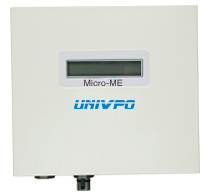 Micro inverter has the integrated MPPT-tracker that tracks the peak power point for connected PV panel that provides with the specific generation that is by 20-30% more in comparison with efficiency of a separate module in the system, consisting of some PV panels and a central on-grid inverter. The use of micro inverters while assembling the on-grid solar power plants provides with the full freedom for installation of PV modules – it is not compulsory to arrange them at the same place and at the same plane. Micro inverters allow constructing the efficient solar power plants, occupying any free plane or yard with PV modules. Unlike on-grid PV systems, based on central inverter, a complex of some PV modules and micro inverters may include PV panels of different type and efficiency. Hereby, the amount of such micro power plants, connected into the single system, is not limited and may freely be increased. One-phase connection diagram of up to 15 micro inverters. The parallel connection of some branches from 15 micro inverters is also possible, as well as union of micro inverters into 3 phase systems. When a system of some micro inverters is used, you can receive the information about its operation online through the internet. Such possibility is provided by monitoring device Micro-ME. The data about electric energy generation may be received simultaneously or for a free period. The statistics is available both for the system in general and for each PV module and micro inverter individually. In addition to collection of information about generation of plant, Micro-ME also protects the micro inverters, connected to it, against shunt currents, voltage spikes and frequency variations in the system.